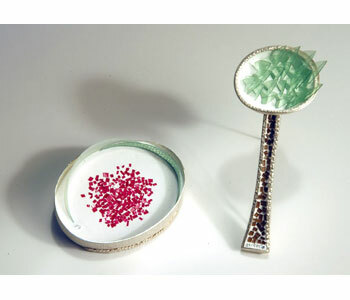 I am a jewellery and object maker, concentrating on reusing materials otherwise destined for landfill. I work predominantly with plastic soda bottles, bamboo and reclaimed Silver and Gold. I focus on positive environmental ideas by continually seeking new and exciting ways to create jewellery, ultimately aiming to highlight preciousness in discarded materials. I consider environmental impact when selecting my materials, I recycle plastics, and use bamboo; the ever-growing grass, because of its magical ability to regenerate so rapidly. I also source old precious metal jewellery and reform it for use in my own work. My inspiration comes mainly from the many beautiful plants and trees of Hawaii.